Despite a din of protests from the New York Times and the Washington Post, the Bush administration refused to support an attempt by the Organization for Economic Co-operation and Development (OECD) to clamp down on tax havens. Fronting for about 30 high-tax governments, the Paris-based organization has been leaning on jurisdictions like the Cayman Islands, Bermuda, and the Isle of Man. If the junta of high-tax governments has its way, not only will there be no place left to run to, but by eliminating what tax havens offer, these governments will have eliminated tax competition, and with it the imperative to downsize their fiefdoms. In a paper deceptively entitled Promoting Tax Competition, OECD überbureaucrats Jeffrey Owens and Richard M. Hammer of Fiscal Affairs build their case against the tax haven. Their starting point is, of course, the implicit understanding that laws regulating how people use their rightful capital are just laws. Our authors grant that property owners ought to be allowed to do that which they do naturally — namely, invest their capital where it will yield the best returns. But this must be done “without impeding the aim of national governments to meet the legitimate expectations of their citizens.” Freedom to make economic decisions must be tempered by the OECD governments’ ongoing confiscatory agenda. The OECD skillfully adopts the language of the anti-globalization camp to agitate against tax havens. Globalization is good, say the writers, but not when the benefits are unequally shared. The OECD frames an alleged “world-wide reduction in welfare” as the consequences of “… tax-induced distortions in capital and financial flows.” This anti-globalization choice of rhetoric is understandable. If anything, the OECD’s efforts are in keeping with government globalization. In advancing the aims of an accretive bureaucracy, what better ally to court than the anti-globalization crowd, with its equal enthusiasm for unbounded state powers? Business, of course, needs no co-opting. Historically, it has always been on the side of government taxation and regulations, because these hamper nascent competition. This official line omits that wealth in the hands of its rightful owners enriches all sectors of the population more than funds in the sticky paws of officials. Using a sample of 92 countries, David Dollar and Aart Kraay, authors of a study entitled Growth Is Good for the Poor, offer evidence that when average incomes rise, the average income of the poorest fifth of society rise proportionately. The study spans four decades, and yields results that hold across regions, periods, income levels and growth rates. By extension, the same effect must hold good whether the reason for a rise in real income is higher earnings or less taxation. Clearly, keeping more of one’s income is not “harmful” to the rightful owners of capital, or to the beneficiaries of its investment, which include any and all bar the taxman. Although the OECD’s meddling gives an impression to the contrary, a tax haven is a sovereign territory that does not levy taxes, or levies them at non-punitive rates. Sometimes these countries opt to tax only domestic — but not foreign — income. The economy of the tax haven depends to a large degree on the banking and financial sectors. With this come imperatives such as financial privacy and secrecy. Hell-bent on forcing low- or no-tax nations to suspend their financial privacy laws, and impelling them, through the threat of sanctions, to provide information to foreign tax collectors, the OECD has set about framing their practices as harmful, if not criminal. 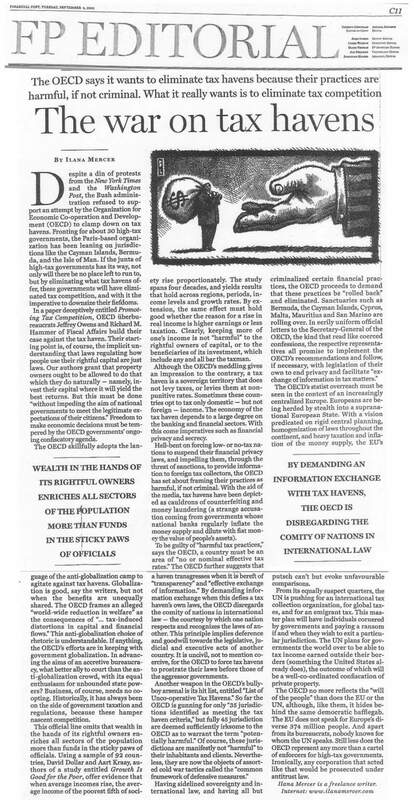 With the aid of the media, tax havens have been depicted as cauldrons of counterfeiting and money laundering (a strange accusation coming from governments whose national banks regularly inflate the money supply and dilute with fiat money the value of people’s assets). To be guilty of “harmful tax practices,” says the OECD, a country must be an area of “no or nominal effective tax rates.” The OECD further suggests that a haven transgresses when it is bereft of “transparency” and “effective exchange of information.” By demanding information exchange when this defies a tax haven’s own laws, the OECD disregards the comity of nations in international law — the courtesy by which one nation respects and recognizes the laws of another. This principle implies deference and goodwill towards the legislative, judicial and executive acts of another country. It is uncivil, not to mention coercive, for the OECD to force tax havens to prostrate their laws before those of the aggressor governments. The OECD’s statist overreach must be seen in the context of an increasingly centralized Europe. Europeans are being herded by stealth into a supranational European State. With a vision predicated on rigid central planning, homogenization of laws throughout the continent, and heavy taxation and inflation of the money supply, the EU’s putsch can’t but evoke unfavourable comparisons. sh to exit a particular jurisdiction. The UN plans for governments the world over to be able to tax income earned outside their borders (something the United States already does), the outcome of which will be a well-co-ordinated confiscation of private property. The OECD no more reflects the “will of the people” than does the EU or the UN, although, like them, it hides behind the same democratic bafflegab. The EU does not speak for Europe’s diverse 374 million people. And apart from its bureaucrats, nobody knows for whom the UN speaks. Still less does the OECD represent any more than a cartel of enforcers for high-tax governments. Ironically, any corporation that acted like that would be prosecuted under antitrust law.